While there isn’t anything extraordinary for the African Development Bank (AfDB) holding its annual meeting outside the continent, in India, experts believe, through the high profile meet in Gandhinagar, which began on May 22 and ends on May 24, the Government of India is seeking to provide a platform to Indian corporates to invest in African continent, especially in agriculture and mining. The Gandhinagar gathering is the fourth time the annual meetings hosted by a non-regional member country, after Valencia, Spain, in 2000; Shanghai, China, in 2007; and Lisbon, Portugal, in 2011. In 2018, the AfDB will meet in Busan, Korea. A senior expert who has been keeping tab on the development, Dr R Sreedhar, director, Environics School of Management Sciences, has told Counterview, the AfDB’s Gandhinagar meet is taking place when several African countries are becoming “wary” of China’s and the western countries' “land grab” in the continent. Africa accounts for about 60% of the world’s arable land, and most of its countries do not achieve 25% of their potential yield. No wonder, therefore, that there has been an increased interest on large-scale investment in land in Africa under the pretext of developing its agriculture. Not without reason, says Sreedhar, key discussions at the Gandhinagar meet are supposed to focus how to leverage agriculture and energy, leadership for agricultural transformation, creative energy solutions to boost African agriculture, innovative financing for agriculture, and financing African infrastructure. According to Sreedhar, holding the meet in Gandhinagar has yet another focus – to ensure that civil society and experts do not make a huge issue out of the corporate world’s towards land grab in Africa. Citing a civil society letter, signed by 111 NGOs, to the European Union France, which are trying to take advantage of the Africa Renewable Energy Initiative (AREI), Sreedhar says, there is already dismay that the AREI’s agenda – to “prioritise the needs of African people, in particular the poor, and contribute to sustainable development through policies and projects that engage with civil society groups and other stakeholders from the outset” – is being undermined. Pointing out that AREI, which is part of the UN’s climate change initiative, was premised on “strong environmental and social criteria to ensure activities meet community needs, avoid land grabs, environmental harm and human rights violations”, the letter accuses EC and France or pushing their own agenda. Doubting, in this context, that any civil society organizations were called at the Gandhinagar meet, Ashok Shrimali, general secretary, Mines, Minerals & People (MM&P), AfDB says, one of its focus areas is “energy and coal mining”, in which several Indian, including Gujarat-based tycoons, are seeking to make big inroads worldwide, including in Africa. Taking a similar view, Debi Goenka, founder, Conservation Action Trust, believes, by holding the meet in Gandhinagar, and not in Delhi, the whole effort of the Government of India is to ensure that there isn’t any diplomatic intervention, on one hand, and civil society influence, on the other. 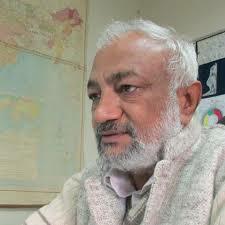 “Civil society in Gujarat does not really exist in the true sense of the word”, Goenka comments.